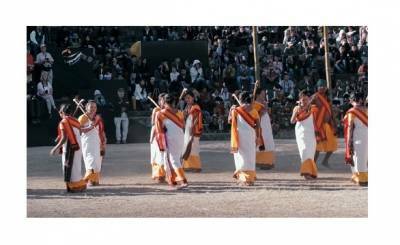 EPIC Channel's new show 'Hornbill' lets you experience the most esteemed festivals of Nagaland- The Hornbill Festival. The eagerly anticipated Hornbill Festival is one of the most esteemed festivals of Nagaland, which is celebrated by locals with much passion and enthusiasm. It began as a week-long festival to concur with Nagaland Statehood Day on December 1 every year. It features traditional arts, dances, folk songs, and ethnic games. All this takes place within immaculate models of tribal huts, complete with wood carvings and hollow log drum instruments, which are beat in haunting symphony at the end of the day. There are plenty of handicraft stalls, food stalls (smoked pork is a local delicacy), and heady rice beer to enjoy as well. Plus, a film festival, adventure activities, and kids' carnival. However, the hottest event (literally!) at the festival is undoubtedly the Naga chilli eating competition! EPIC Channel lets you experience the Hornbill festival of Nagaland which has evolved over the years from being a celebration of the heritage and tradition of the Nagas into a huge cultural event for all the 8 Northeast States. Named after the Great Indian Hornbill, the revered forest bird of the Nagas, the festival today has come to be known as the “festival of festivals” and is a must visit for any discerning traveller . Watch the full episode on 24th November at 3 pm, 5 pm, 7 pm, 9 pm only on EPIC channel.